Last week I was joking to a dispairing Labour moderate that his best chance of conveying the gravity of the current situation facing the party to all of its factions would be if a Labour MP with a small majority over the Tories and a lot of Leave-voting constituents resigned and set up a by-election. 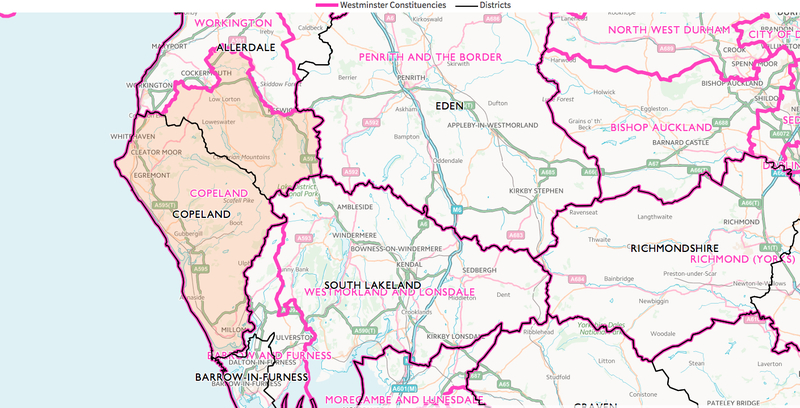 The seat (previously represented by Jack Cunningham) is larger than the Copeland district, and the current best estimate of the EU referendum is that it voted 59.8% Leave. It was first fought under its current name in 1983, having previously been called Whitehaven. The Labour majority has fallen at every election this century. The seat’s demographics aren’t out of line with its politics, with double the national average employed in manufacturing, but below average health and qualifications and slightly more over 65s. The Leave vote and the small Labour majority (and Labour’s recent by-election performances) have led to a lot of speculation that the Conservatives could win it, for the first time since 1931. But I can’t stress enough how rare it would be for a government to gain a seat in a by-election – it hasn’t happened for decades and of the four postwar case studies (out of 452 by-elections in Great Britain), two involved very strange electoral (and not just political) circumstances, one involved moderately strange circumstances, and one was in an ultra, ultra marginal seat. It is much more normal for governing parties lose ground in by-elections, and the betting markets and Twittersphere may be getting a bit ahead of themselves. But could the Tories do it anyway? They need a swing of 3.3% from Labour, not much more than the 2.2% swing they achieved to increase their majority in Sleaford. They will try to spin the circumstances of the by-election to their advantage, and although local factors usually aren’t as important as is commonly assumed, the importance of Sellafield to the local economy will not help the anti-nuclear Corbyn. It seems as though the Conservatives have relatively little trouble getting their vote out in Leavey areas. So what it will probably come down to is how well they and (more importantly) Labour can resist the Lib Dem and UKIP charge. I’m going to say that a Tory gain is possible, but no more than that. The campaign sounds like being a long one, with Reed not planning to stand down until late January, making a late February or March date likely.